Adult stem cells are undifferentiated cells, found throughout the body after development, that multiply by cell division to replenish dying cells and regenerate damaged tissues. Also known as somatic stem cells (from Greek Σωματικóς, meaning of the body), they can be found in juvenile as well as adult animals and humans, unlike embryonic stem cells. Scientific interest in adult stem cells is centered on their ability to divide or self-renew indefinitely, and generate all the cell types of the organ from which they originate, potentially regenerating the entire organ from a few cells. Unlike for embryonic stem cells, the use of human adult stem cells in research and therapy is not considered to be controversial, as they are derived from adult tissue samples rather than human embryos designated for scientific research. They have mainly been studied in humans and model organisms such as mice and rats. Self-renewal, which is the ability to go through numerous cycles of cell division while still maintaining its undifferentiated state. Multipotency or multidifferentiative potential, which is the ability to generate progeny of several distinct cell types, (for example glial cells and neurons) as opposed to unipotency, which is the term for cells that are restricted to producing a single-cell type. However, some researchers do not consider multipotency to be essential, and believe that unipotent self-renewing stem cells can exist. These properties can be illustrated with relative ease in vitro, using methods such as clonogenic assays, where the progeny of a single cell is characterized. However, it is known that in vitro cell culture conditions can alter the behavior of cells, proving that a particular subpopulation of cells possesses stem cell properties in vivo is challenging, and so considerable debate exists as to whether some proposed stem cell populations in the adult are indeed stem cells. Mesenchymal stem cells (MSCs) are of stromal origin and may differentiate into a variety of tissues. MSCs have been isolated from placenta, adipose tissue, lung, bone marrow and blood, Wharton's jelly from the umbilical cord, and teeth (perivascular niche of dental pulp and periodontal ligament). MSCs are attractive for clinical therapy due to their ability to differentiate, provide trophic support, and modulate innate immune response. 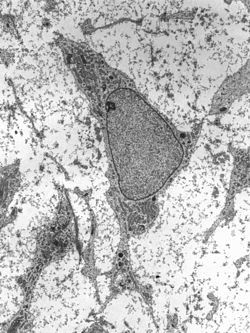 These cells have the ability to differentiate into various cell types such as osteoblasts, chondroblasts, adipocytes, neuroectodermal cells, and hepatocytes. Bioactive mediators that favor local cell growth are also secreted by MSCs. Anti-inflammatory effects on the local microenvironment, which promote tissue healing, are also observed. The inflammatory response can be modulated by adipose-derived regenerative cells (ADRC) including mesenchymal stem cells and regulatory T-lymphocytes. The mesenchymal stem cells thus alter the outcome of the immune response by changing the cytokine secretion of dendritic and T-cell subsets. This results in a shift from a pro-inflammatory environment to an anti-inflammatory or tolerant cell environment. The existence of stem cells in the adult brain has been postulated following the discovery that the process of neurogenesis, the birth of new neurons, continues into adulthood in rats. The presence of stem cells in the mature primate brain was first reported in 1967. It has since been shown that new neurons are generated in adult mice, songbirds and primates, including humans. Normally, adult neurogenesis is restricted to two areas of the brain – the subventricular zone, which lines the lateral ventricles, and the dentate gyrus of the hippocampal formation. Although the generation of new neurons in the hippocampus is well established, the presence of true self-renewing stem cells there has been debated. Under certain circumstances, such as following tissue damage in ischemia, neurogenesis can be induced in other brain regions, including the neocortex. Neural stem cells are commonly cultured in vitro as so called neurospheres – floating heterogeneous aggregates of cells, containing a large proportion of stem cells. They can be propagated for extended periods of time and differentiated into both neuronal and glia cells, and therefore behave as stem cells. However, some recent studies suggest that this behaviour is induced by the culture conditions in progenitor cells, the progeny of stem cell division that normally undergo a strictly limited number of replication cycles in vivo. Furthermore, neurosphere-derived cells do not behave as stem cells when transplanted back into the brain. Discoveries in recent years have suggested that adult stem cells might have the ability to differentiate into cell types from different germ layers. For instance, neural stem cells from the brain, which are derived from ectoderm, can differentiate into ectoderm, mesoderm, and endoderm. Stem cells from the bone marrow, which is derived from mesoderm, can differentiate into liver, lung, GI tract and skin, which are derived from endoderm and mesoderm. This phenomenon is referred to as stem cell transdifferentiation or plasticity. It can be induced by modifying the growth medium when stem cells are cultured in vitro or transplanting them to an organ of the body different from the one they were originally isolated from. There is yet no consensus among biologists on the prevalence and physiological and therapeutic relevance of stem cell plasticity. More recent findings suggest that pluripotent stem cells may reside in blood and adult tissues in a dormant state. These cells are referred to as "Blastomere Like Stem Cells" and "very small embryonic like" – "VSEL" stem cells, and display pluripotency in vitro. As BLSC's and VSEL cells are present in virtually all adult tissues, including lung, brain, kidneys, muscles, and pancreas Co-purification of BLSC's and VSEL cells with other populations of adult stem cells may explain the apparent pluripotency of adult stem cell populations. However, recent studies have shown that both human and murine VSEL cells lack stem cell characteristics and are not pluripotent. Adult stem cells can, however, be artificially reverted to a state where they behave like embryonic stem cells (including the associated DNA repair mechanisms). This was done with mice as early as 2006 with future prospects to slow down human aging substantially. Such cells are one of the various classes of induced stem cells. The Notch pathway has been known to developmental biologists for decades. Its role in control of stem cell proliferation has now been demonstrated for several cell types including haematopoietic, neural, and mammary stem cells. These developmental pathways are also strongly implicated as stem cell regulators. The TGFβ family of cytokines regulate the stemness of both normal and cancer stem cells. The therapeutic potential of adult stem cells is the focus of much scientific research, due to their ability to be harvested from the parent body that is females during the delivery. In common with embryonic stem cells, adult stem cells have the ability to differentiate into more than one cell type, but unlike the former they are often restricted to certain types or "lineages". The ability of a differentiated stem cell of one lineage to produce cells of a different lineage is called transdifferentiation. Some types of adult stem cells are more capable of transdifferentiation than others, but for many there is no evidence that such a transformation is possible. Consequently, adult stem therapies require a stem cell source of the specific lineage needed, and harvesting and/or culturing them up to the numbers required is a challenge. Additionally, cues from the immediate environment (including how stiff or porous the surrounding structure/extracellular matrix is) can alter or enhance the fate and differentiation of the stem cells. ^ Mlsna, Lucas J. (2010). "Stem Cell Based Treatments and Novel Considerations for Conscience Clause Legislation". Indiana Health Law Review. United States: Indiana University Robert H. McKinney School of Law. 8 (2): 471–496. ISSN 1549-3199. OCLC 54703225. ^ a b Liu S, Dontu G, Wicha MS (2005). "Mammary stem cells, self-renewal pathways, and carcinogenesis". Breast Cancer Research. 7 (3): 86–95. doi:10.1186/bcr1021. PMC 1143566. PMID 15987436. ^ Van Der Flier, L. G.; Clevers, H. (2009). "Stem Cells, Self-Renewal, and Differentiation in the Intestinal Epithelium". Annual Review of Physiology. 71: 241–260. doi:10.1146/annurev.physiol.010908.163145. PMID 18808327. ^ Barker, N.; Ridgway, R. A.; Van Es, J. H.; Van De Wetering, M.; Begthel, H.; Van Den Born, M.; Danenberg, E.; Clarke, A. R.; Sansom, O. J.; Clevers, H. (2008). "Crypt stem cells as the cells-of-origin of intestinal cancer". Nature. 457 (7229): 608–611. Bibcode:2009Natur.457..608B. doi:10.1038/nature07602. PMID 19092804. ^ a b Phinney DG, Prockop DJ (November 2007). "Concise review: mesenchymal stem/multipotent stromal cells: the state of transdifferentiation and modes of tissue repair – current views". Stem Cells. 25 (11): 2896–2902. doi:10.1634/stemcells.2007-0637. PMID 17901396. ^ Shi S, Bartold PM, Miura M, Seo BM, Robey PG, Gronthos S (August 2005). "The efficacy of mesenchymal stem cells to regenerate and repair dental structures". Orthod Craniofac Res. 8 (3): 191–199. doi:10.1111/j.1601-6343.2005.00331.x. PMID 16022721. ^ Bai, Xiaowen; Alt, Eckhard (22 October 2010). "Myocardial regeneration potential of adipose tissue-derived stem cells". Biochemical and Biophysical Research Communications. 401 (3): 321–326. doi:10.1016/j.bbrc.2010.09.012. ^ Aggarwal, Sudeepta; Pittenger, Mark F. (15 February 2005). "Human mesenchymal stem cells modulate allogeneic immune cell responses". Blood. 105 (4): 1815–1822. doi:10.1182/blood-2004-04-1559. ISSN 0006-4971. PMID 15494428. ^ Augello, Andrea; Tasso, Roberta; Negrini, Simone Maria; Cancedda, Ranieri; Pennesi, Giuseppina (1 April 2007). "Cell therapy using allogeneic bone marrow mesenchymal stem cells prevents tissue damage in collagen-induced arthritis". Arthritis and Rheumatism. 56 (4): 1175–1186. doi:10.1002/art.22511. ISSN 0004-3591. PMID 17393437. ^ Altman J, Das GD (June 1965). "Autoradiographic and histological evidence of postnatal hippocampal neurogenesis in rats". The Journal of Comparative Neurology. 124 (3): 319–35. doi:10.1002/cne.901240303. PMID 5861717. ^ Lewis PD (March 1968). "Mitotic activity in the primate subependymal layer and the genesis of gliomas". Nature. 217 (5132): 974–5. Bibcode:1968Natur.217..974L. doi:10.1038/217974a0. PMID 4966809. ^ Alvarez-Buylla A, Seri B, Doetsch F (April 2002). "Identification of neural stem cells in the adult vertebrate brain". Brain Research Bulletin. 57 (6): 751–8. doi:10.1016/S0361-9230(01)00770-5. PMID 12031271. ^ Bull ND, Bartlett PF (November 2005). "The adult mouse hippocampal progenitor is neurogenic but not a stem cell". The Journal of Neuroscience. 25 (47): 10815–21. doi:10.1523/JNEUROSCI.3249-05.2005. PMID 16306394. ^ Reynolds BA, Weiss S (March 1992). "Generation of neurons and astrocytes from isolated cells of the adult mammalian central nervous system". Science. 255 (5052): 1707–10. Bibcode:1992Sci...255.1707R. doi:10.1126/science.1553558. PMID 1553558. ^ Doetsch F, Petreanu L, Caille I, Garcia-Verdugo JM, Alvarez-Buylla A (December 2002). "EGF converts transit-amplifying neurogenic precursors in the adult brain into multipotent stem cells". Neuron. 36 (6): 1021–34. doi:10.1016/S0896-6273(02)01133-9. PMID 12495619. ^ Marshall GP, Laywell ED, Zheng T, Steindler DA, Scott EW (March 2006). "In vitro-derived "neural stem cells" function as neural progenitors without the capacity for self-renewal". Stem Cells. 24 (3): 731–8. doi:10.1634/stemcells.2005-0245. PMID 16339644. ^ Bjornson CR, Rietze RL, Reynolds BA, Magli MC, Vescovi AL (January 1999). "Turning brain into blood: a hematopoietic fate adopted by adult neural stem cells in vivo". Science. 283 (5401): 534–7. Bibcode:1999Sci...283..534B. doi:10.1126/science.283.5401.534. PMID 9915700. ^ Murrell W, Féron F, Wetzig A, et al. (June 2005). "Multipotent stem cells from adult olfactory mucosa". Developmental Dynamics. 233 (2): 496–515. doi:10.1002/dvdy.20360. PMID 15782416. ^ Sieber-Blum M, Hu Y (December 2008). "Epidermal neural crest stem cells (EPI-NCSC) and pluripotency". Stem Cell Rev. 4 (4): 256–60. doi:10.1007/s12015-008-9042-0. PMID 18712509. ^ Kruger GM, Mosher JT, Bixby S, Joseph N, Iwashita T, Morrison SJ (August 2002). "Neural Crest Stem Cells Persist in the Adult Gut but Undergo Changes in Self-Renewal, Neuronal Subtype Potential, and Factor Responsiveness". Neuron. 35 (4): 657–69. doi:10.1016/S0896-6273(02)00827-9. PMC 2728576. PMID 12194866. ^ "Testicle cells may aid research". BBC. 25 March 2006. ^ CBS/Associated Press (24 March 2006). "Study: Mice Testes Act Like Stem Cells". CBS. ^ Rick Weiss (25 March 2006). "Embryonic Stem Cell Success". Washington Post. ^ "Promising New Source Of Stem Cells: Mouse Testes Produce Wide Range Of Tissue Types". Science Daily. 24 September 2007. ^ Barbara Miller (20 September 2007). "Testicles yield stem cells in science breakthrough". Australian Broadcasting Corporation. ^ J.R. Minkel (19 September 2007). "Testes May Prove Fertile Source of Stem Cells". Scientific American. ^ "Stem Cells in Adult Testes Provide Alternative to Embryonic Stem Cells for Organ Regeneration". Cornell University. 20 September 2007. ^ Rob Waters (8 October 2008). "Testicle Stem Cells Become Bone, Muscle in German Experiments". Bloomberg. ^ Nora Schultz (9 October 2008). "A Source of Men's Stem Cells – Stem cells from human testes could be used for personalized medicine". Technology Review. ^ Maggie Fox (Reuters) (2 April 2006). "U.S. Firm Says It Made Stem Cells From Human Testes". Washington Post. ^ Clarke, D. L.; Johansson, CB; Wilbertz, J; Veress, B; Nilsson, E; Karlström, H; Lendahl, U; Frisén, J (2000). "Generalized Potential of Adult Neural Stem Cells". Science. 288 (5471): 1660–1663. Bibcode:2000Sci...288.1660C. doi:10.1126/science.288.5471.1660. PMID 10834848. ^ Krause, Diane S.; Theise, Neil D.; Collector, Michael I.; Henegariu, Octavian; Hwang, Sonya; Gardner, Rebekah; Neutzel, Sara; Sharkis, Saul J. (2001). "Multi-Organ, Multi-Lineage Engraftment by a Single Bone Marrow-Derived Stem Cell". Cell. 105 (3): 369–377. doi:10.1016/S0092-8674(01)00328-2. PMID 11348593. ^ a b Kucia, M; Reca, R; Campbell, F R; Zuba-Surma, E; Majka, M; Ratajczak, J; Ratajczak, M Z (2006). "A population of very small embryonic-like (VSEL) CXCR4+SSEA-1+Oct-4+ stem cells identified in adult bone marrow". Leukemia. 20 (5): 857–869. doi:10.1038/sj.leu.2404171. PMID 16498386. ^ Zuba-Surma, Ewa K.; Kucia, Magdalena; Wu, Wan; Klich, Izabela; Lillard, James W.; Ratajczak, Janina; Ratajczak, Mariusz Z. (2008). "Very small embryonic-like stem cells are present in adult murine organs: ImageStream-based morphological analysis and distribution studies". Cytometry Part A. 73A (12): 1116–1127. doi:10.1002/cyto.a.20667. PMC 2646009. ^ Danova-Alt, Ralitza; Heider, Andreas; Egger, Dietmar; Cross, Michael; Alt, Rüdiger; Ivanovic, Zoran (2 April 2012). Ivanovic, Zoran (ed.). "Very Small Embryonic-Like Stem Cells Purified from Umbilical Cord Blood Lack Stem Cell Characteristics". PLoS ONE. 7 (4): e34899. Bibcode:2012PLoSO...734899D. doi:10.1371/journal.pone.0034899. PMC 3318011. PMID 22509366. ^ Szade, Krzysztof; Bukowska-Strakova, Karolina; Nowak, Witold Norbert; Szade, Agata; Kachamakova-Trojanowska, Neli; Zukowska, Monika; Jozkowicz, Alicja; Dulak, Jozef; Asakura, Atsushi (16 May 2013). Asakura, Atsushi (ed.). "Murine Bone Marrow Lin−Sca-1+CD45 − Very Small Embryonic-Like (VSEL) Cells Are Heterogeneous Population Lacking Oct-4A Expression". PLoS ONE. 8 (5): e63329. Bibcode:2013PLoSO...863329S. doi:10.1371/journal.pone.0063329. PMC 3656957. PMID 23696815. ^ Miyanishi, Masanori; Mori, Yasuo; Seita, Jun; Chen, James Y.; Karten, Seth; Chan, Charles K.F. ; Nakauchi, Hiromitsu; Weissman, Irving L. (31 July 2013). "Do Pluripotent Stem Cells Exist in Adult Mice as Very Small Embryonic Stem Cells?". Stem Cell Reports. 1 (2): 198–208. doi:10.1016/j.stemcr.2013.07.001. PMC 3757755. PMID 24052953. ^ a b Behrens A, van Deursen JM, Rudolph KL, Schumacher B (2014). "Impact of genomic damage and ageing on stem cell function". Nat. Cell Biol. 16 (3): 201–207. doi:10.1038/ncb2928. PMC 4214082. PMID 24576896. ^ Ertelt, Steven. 4 July 2006. "Researcher Turns Adult Mouse Skin Cells Into Embryonic Stem Cells." Bioethics. URL: http://www.lifenews.com/2006/07/04/bio-1593. ^ Dontu G, Jackson KW, McNicholas E, Kawamura MJ, Abdallah WM, Wicha MS (2004). "Role of Notch signaling in cell-fate determination of human mammary stem/progenitor cells". Breast Cancer Research. 6 (6): R605–615. doi:10.1186/bcr920. PMC 1064073. PMID 15535842. ^ Beachy PA, Karhadkar SS, Berman DM (November 2004). "Tissue repair and stem cell renewal in carcinogenesis". Nature. 432 (7015): 324–331. Bibcode:2004Natur.432..324B. doi:10.1038/nature03100. PMID 15549094. ^ Sakaki-Yumoto M, Katsuno Y, Derynck R (2013). "TGF-β family signaling in stem cells". Biochimica et Biophysica Acta. 1830 (2): 2280–2296. doi:10.1016/j.bbagen.2012.08.008. PMC 4240309. PMID 22959078. ^ Srivastava A, Bapat M, Ranade S, Srinivasan V, Murugan P, Manjunath S, Thamaraikannan P, Abraham S (2010). "Autologous Multiple Injections of in Vitro Expanded Autologous Bone Marrow Stem Cells For Cervical Level Spinal Cord Injury – A Case Report". Journal of Stem Cells and Regenerative Medicine. ^ Terai S, Ishikawa T, Omori K, Aoyama K, Marumoto Y, Urata Y, Yokoyama Y, Uchida K, Yamasaki T, Fujii Y, Okita K, Sakaida I (2006). "Improved liver function in patients with liver cirrhosis after autologous bone marrow cell infusion therapy". Stem Cells. 24 (10): 2292–2298. doi:10.1634/stemcells.2005-0542. PMID 16778155. ^ Subrammaniyan R, Amalorpavanathan J, Shankar R, Rajkumar M, Baskar S, Manjunath SR, Senthilkumar R, Murugan P, Srinivasan VR, Abraham S (2011). "Application of autologous bone marrow mononuclear cells in six patients with advanced chronic critical limb ischemia as a result of diabetes: our experience". Cytotherapy. 13 (8): 993–999. doi:10.3109/14653249.2011.579961. PMID 21671823. ^ Dedeepiya V; Rao Y Y; Jayakrishnan G; Parthiban JKBC; Baskar S; Manjunath S; Senthilkumar R; Abraham S (2012). "Index of CD34+ cells and mononuclear cells in the bone marrow of spinal cord injury patients of different age groups – A comparative analysis". Bone Marrow Research. 2012: 1–8. doi:10.1155/2012/787414. PMC 3398573. PMID 22830032. ^ Fischer UM, Harting MT, Jimenez F, et al. (June 2009). "Pulmonary passage is a major obstacle for intravenous stem cell delivery: the pulmonary first-pass effect". Stem Cells and Development. 18 (5): 683–692. doi:10.1089/scd.2008.0253. PMC 3190292. PMID 19099374. ^ Wakitani S, Nawata M, Tensho K, Okabe T, Machida H, Ohgushi H (2007). "Repair of articular cartilage defects in the patello-femoral joint with autologous bone marrow mesenchymal cell transplantation: three case reports involving nine defects in five knees". Journal of Tissue Engineering and Regenerative Medicine. 1 (1): 74–79. doi:10.1002/term.8. PMID 18038395. ^ Centeno; et al. "Regeneration of meniscus cartilage in a knee treated with percutaneously implanted autologous mesenchymal stem cells, platelate lysate, and dexamethasome". ^ Centeno CJ, Busse D, Kisiday J, Keohan C, Freeman M, Karli D (December 2008). "Regeneration of meniscus cartilage in a knee treated with percutaneously implanted autologous mesenchymal stem cells". Medical Hypotheses. 71 (6): 900–908. doi:10.1016/j.mehy.2008.06.042. PMID 18786777. ^ Centeno CJ, Busse D, Kisiday J, Keohan C, Freeman M, Karli D (2008). "Increased knee cartilage volume in degenerative joint disease using percutaneously implanted, autologous mesenchymal stem cells". Pain Physician. 11 (3): 343–353. PMID 18523506. Archived from the original on 4 April 2009. ^ Centeno CJ, Schultz JR, Cheever M, Robinson B, Freeman M, Marasco W (2010). "Safety and complications reporting on the re-implantation of culture-expanded mesenchymal stem cells using autologous platelet lysate technique". Curr Stem Cell Res Ther. 5 (1): 81–93. doi:10.2174/157488810790442796. PMID 19951252. ^ PR Newswire. "The International Society for Stem Cell Research Releases New Guidelines to Shape Future of Stem Cell Therapy Regulation needed as new study reveals clinics exaggerate claims and omit risks". ^ Liao, YH; Verchere, CB; Warnock, GL (April 2007). "Adult stem or progenitor cells in treatment for type 1 diabetes: current progress". Canadian Journal of Surgery. 50 (2): 137–142. PMC 2384257. PMID 17550719. ^ Mimeault, M; Hauke, R; Batra, S K (1 August 2007). "Stem Cells: A Revolution in Therapeutics – Recent Advances in Stem Cell Biology and Their Therapeutic Applications in Regenerative Medicine and Cancer Therapies". Clinical Pharmacology & Therapeutics. 82 (3): 252–264. doi:10.1038/sj.clpt.6100301. PMID 17671448. ^ Christoforou, N; Gearhart, JD (May – June 2007). "Stem cells and their potential in cell-based cardiac therapies". Progress in Cardiovascular Diseases. 49 (6): 396–413. doi:10.1016/j.pcad.2007.02.006. PMID 17498520. ^ Raff, M (2003). "Adult stem cell plasticity: Fact or Artifact?". Annual Review of Cell and Developmental Biology. 19: 1–22. doi:10.1146/annurev.cellbio.19.111301.143037. PMID 14570561. ^ Smith, S; Neaves, W; Teitelbaum, S; Prentice, D. A.; Tarne, G. (8 June 2007). "Adult Versus Embryonic Stem Cells: Treatments". Science. 316 (5830): 1422–1423. doi:10.1126/science.316.5830.1422b. PMID 17556566. ^ Huang, C; et al. (2015). "Environmental physical cues determine the lineage specification of mesenchymal stem cells". Biochim Biophys Acta. 1850: 1261–1266. doi:10.1016/j.bbagen.2015.02.011. PMC 4411082. PMID 25727396. ^ Ratajczak MZ, Machalinski B, Wojakowski W, Ratajczak J, Kucia M (2007). "A hypothesis for an embryonic origin of pluripotent Oct-4(+) stem cells in adult bone marrow and other tissues". Leukemia. 21 (5): 860–867. doi:10.1038/sj.leu.2404630. PMID 17344915. ^ "Me too, too – How to make human embryonic stem cells without destroying human embryos". The Economist. 22 November 2007. ^ Gina Kolata (22 November 2007). "Man Who Helped Start Stem Cell War May End It". New York Times. ^ Gina Kolata (21 November 2007). "Scientists Bypass Need for Embryo to Get Stem Cells". New York Times. ^ Anne McIlroy (21 November 2007). "Stem-cell method hailed as 'massive breakthrough'". Globe and Mail. Canada. ^ Alice Park (20 November 2007). "A Breakthrough on Stem Cells". Time Magazine. ^ Barrilleaux B, Phinney DG, Prockop DJ, O'Connor KC (2006). "Review: ex vivo engineering of living tissues with adult stem cells". Tissue Eng. 12 (11): 3007–3019. doi:10.1089/ten.2006.12.3007. PMID 17518617. ^ Gimble JM, Katz AJ, Bunnell BA (2007). "Adipose-derived stem cells for regenerative medicine". Circ. Res. 100 (9): 1249–1260. doi:10.1161/01.RES.0000265074.83288.09. PMID 17495232. ^ Gardner RL (March 2002). "Stem cells: potency, plasticity and public perception". Journal of Anatomy. 200 (Pt 3): 277–282. doi:10.1046/j.1469-7580.2002.00029.x. PMC 1570679. PMID 12033732. ^ Takahashi K, Yamanaka S (2006). "Induction of pluripotent stem cells from mouse embryonic and adult fibroblast cultures by defined factors". Cell. 126 (4): 663–676. doi:10.1016/j.cell.2006.07.024. PMID 16904174. This page was last edited on 1 April 2019, at 11:41 (UTC).